Reflo: Sustainable Water Solutions ($25,000)Reflo is a new 501(c)3 that offers both free and low-cost professional designing and building services to community groups, non-profits, schools, and other entities to support green infrastructure and water reuse projects. 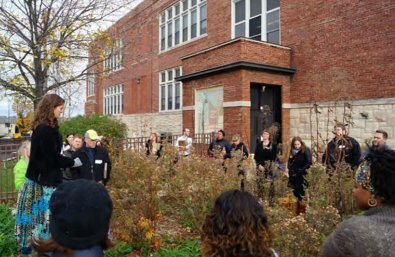 This $25,000 award will enable Reflo to work with two Milwaukee schools to create conceptual designs for green infrastructure projects. These designs will include estimated budgets, timelines, proposals for curriculum involvement, and funding ideas. These efforts have an ultimate goal of increasing the number of meaningful green infrastructure projects ready to receive funding for construction and maintenance.